Every year, we are touched and inspired by the stories of dedicated horse lovers around the country. It is our pleasure to share them with you, while promoting the great things they do. 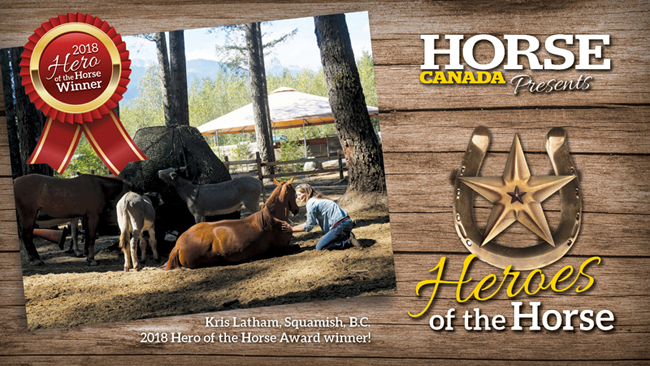 The nomination period for this year’s Hero of the Horse Award is now open. Use the form below to make your nomination. Spread the word! Nominate any Canadian horse person you feel has made a special effort to improve the lives of a horse or horses by preserving or restoring their welfare, or making a marked contribution to their well-being in some special way. Please note that while previous finalists are eligible for entry, past winners are not. The finalists’ stories will be posted on Horse-Canada.com to be read and voted on in August. The winner’s story will be featured in the November/December issue of Horse Canada and they will receive a trophy, along with $2,000 to continue their work. PLUS, Canadian Saddlery will donate 12 blankets of any size (234 Goliath Regular Neck Turnout or 235 Mid Neck Turnouts) – a $2,100 value! * How is his/her work making a difference? Are there any links (to websites, social media etc.) that you want to share? * Upload a photo of your hero (max filesize 10MB).